The merger of multiple weak storm systems will give birth to a strong coastal low over the course of Thursday and Friday. The first merger will occur between a small low that has dropped south through the Great Lakes into the Ohio Valley and a second low pressure along the coast of North Carolina. This combined low will then be enhanced by a third feature over Canada that will partially be absorbed tonight as the coastal system moves north. Rapid strengthening of the low will occur as it travels from near Washington DC this evening into southern New England Friday morning. Despite some media members calling it a “bomb cyclone”, the strengthening of the low will not be intense enough to meet the technical criteria for that term to be valid. As the low strengthens, cold air and moisture will intensify on the backside of the low, including in Upstate New York. The low will slowly meander northeast on Friday, ending up along the coast of Maine Saturday morning. High pressure will build into the Ohio Valley Saturday as the low picks up speed and departs. Finger Lakes Weather continues to need additional financial support to ensure its services can continue. 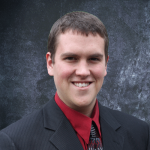 A recent out of my control change in the financial structure of FLX Weather has left my budget severely short. Many users have already contributed, and I am extremely grateful for their support. I do need additional funds, however. Please give serious consideration to contributing to Finger Lakes Weather if you find my services useful. 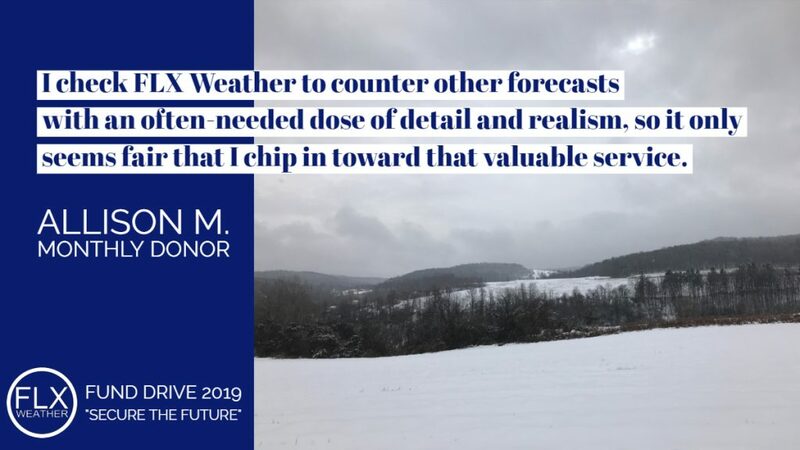 A small donation of $5 or $10 per month, which is less than Netflix ($15/mo) will go a long way in securing the future of no-hype, on-demand, science-based forecasting for our region. Finger Lakes Weather needs your support to continue providing no-hype forecasting! 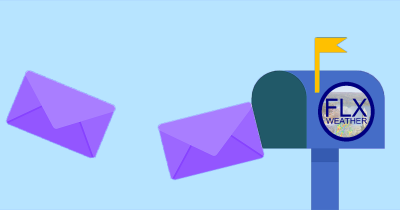 Click to donate, or use the form above! 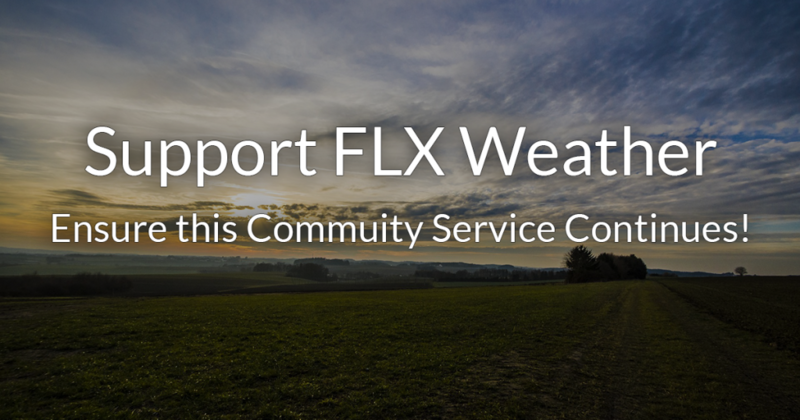 Without additional support, the future of FLX Weather is in jeopardy. Already this morning, some disorganized light rain showers are falling in the Finger Lakes. Temperatures are generally in the mid 30s. Scattered showers will continue this morning and should become more isolated for the afternoon. High temperatures will range from the low 50s across the I-90 and I-390 corridors to the mid 40s in the eastern Southern Tier. A band of heavier precipitation will develop as the coastal low moves north tonight. There is still a high degree of uncertainty where this sets up, but I expect the heaviest precipitation to be along or east of I-81. Most of this should fall as rain before gradually mixing with and turning to snow after midnight. 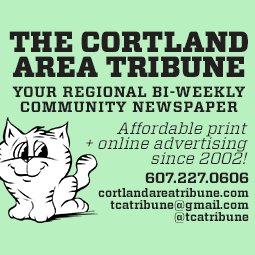 Accumulations, if any, seem to be minor and mostly contained to Cortland County. This does remain uncertain though and will be addressed further with this evening’s update. The band of heavy precipitation will move east Friday morning, heading through the Catskills and Adirondacks. 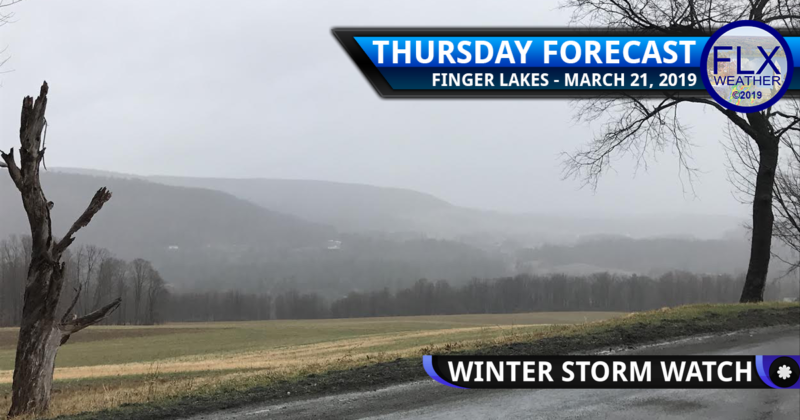 The Finger Lakes will have a window of relatively quiet weather during the mid and late morning hours before some flurries begin to develop by midday. Snow showers will become more widespread through the afternoon, but the intensity should remain light to moderate. Temperatures Friday will reach a high near 40 degrees in the early afternoon and should remain at or above 35 degrees through 5 or 6 pm. Accumulations will therefore be minimal Friday afternoon with few travel concerns. After dinnertime, temperatures will drop back into the upper 20s and the snow will become better organized as the wrap around moisture interacts with Lake Ontario. The heaviest snow is likely over much of Cayuga County, Onondaga County, and into Oswego County to the north. Steady but not as intense snow will extend west towards Rochester and south towards Cortland. In classic lake effect fashion, much of the Southern Tier will see very little snow with minor amounts outside of the prime snowbelts. I will likely publish my one and only snow map for this event with this evening’s update. I aim to publish only one single map to decrease confusion. I see no point in making a map earlier if I know I would only need to change it later on. Dry air will wrap around the low early Saturday. By sunrise, the steady snow may be contained to areas east of Cayuga Lake and the entire region could be cleared as early as 9 am. Winds will be gusty as well during this system. Gusts of 30-40 mph will be commonplace from Friday morning through Saturday afternoon. These winds will be from the northwest. Sunday will be a dry, sunny, and mild day as temperatures return to the 50s for many areas. Unfortunately, it will be a very brief warm up with highs back into the 30s for Monday and Tuesday. 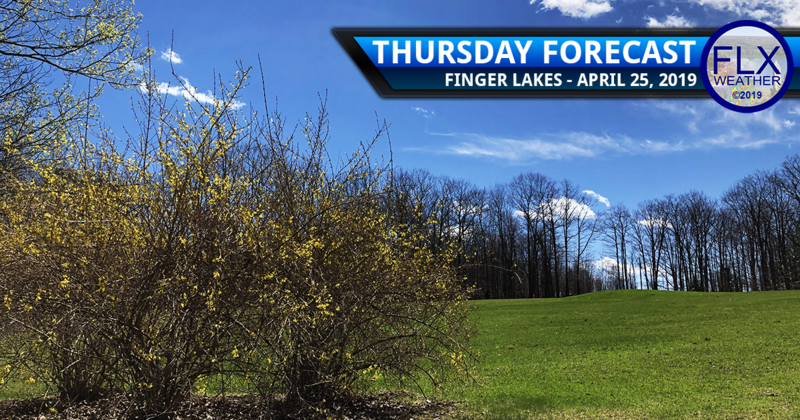 Click to contribute to the 2019 Fund Drive to keep Finger Lakes Weather funded!